When you think about Tahiti, what images come to mind? 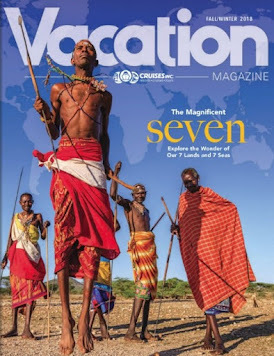 For me, the images include palm trees, Tahitian huts, blue skies with puffy clouds, and many shades of crystal clear blue water. 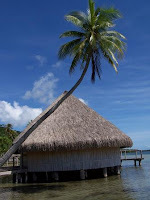 Our next port of call on our 10 Day Polynesia/Cook Islands Cruise was Huahine, French Polynesia. 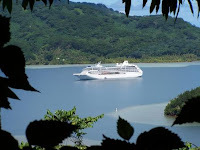 The Tahitian Princess dropped anchor in the middle of the harbor and we used the ships tenders to go ashore. If your images of Tahiti included the ones I mentioned above, then you won't be disappointed in Huahine. In otder for us to get an appreciation for Huahine, we booked the Huahine Island Highlights shore excursion. First stop on our tour was at Fare Potee which is a chief's residence or gathering place of the community. 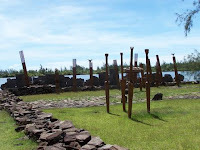 It is built on the grounds of one of the larger Marae complexes on Huahine. A Marae is a sacred place which served both religious and social purposes in pre-Christian Polynesian societies. We had free time to wander through the sacred grounds of the Marea temple. Adjacent to Fare Potee was a vanilla plantation. 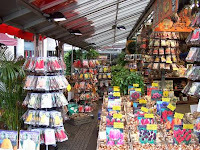 Inside the little store, we were able to purchase vanilla beans and other Tahitian vanilla products. Make sure you check the customs regulations before purchasing vanilla to bring back home. 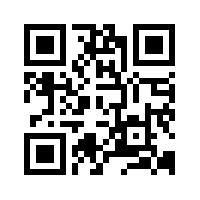 For more information about Tahitian vanilla, check out this site. The next stop on our tour was Faei where the blue-eyed, freshwater eels live in the stream. A local native woman was walking in the water feeding the eels. They range in size from three to six feet in length. These eels, which are very well known, are considered to be sacred. They have a long history which you can learn more about from this site of unusual places to visit. where we could enjoy panoramic views of the island, Maroe Bay, the lagoon, and of course the Tahitian Princess anchored in the bay. The highlights tour was a good way to explore Huahine. The weather was perfect, making for a fabulous time. I've included a sampling of pictures from the tour here. See the rest of our pictures in our Huahine Highlights photo album. Next time I'll take you to Rarotonga where our exploration of Tahiti continues under the sea as well as on land and water. After a good night's sleep we were ready to explore Papette, Tahiti. We decided to book the Papenoo Valley And Waterfall By 4wd shore excursion offered by Princess Cruises. 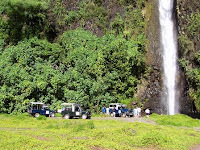 If you are in reasonably good health (no heart or back problems for example) a 4WD adventure is a great way to see the island of Tahiti. There is an expansive network of off-road trails which transport you from sea level to the highest mountain peaks on the island. We began our tour from the pier and made our first stop at Pointe de Tapahi where we had magnificent views of the east coast of Tahiti. Lush vegetaion framed our view of the scenic coastline. If it weren't for the white caps which formed as waves splashed against the rocks below, it would have been hard to determine where the sky ended and the sea began. As usual, I won't leave it to your imagination to picture this scene. See our Papette photo album for pictures from this tour. The tour continued with a drive through the Papenoo Valley. Our jeep caravan stopped in the midst of lush vegetation where the sound of rushing water could be heard. It didn't take long before we could see the towering waterfall ahead of us. We have seen many waterfalls in our journeys, but never anything as amazing as the ones we saw on Tahiti island. Some of our group took a dip in the pool formed at the base of the waterfall. We drove through the valley stopping for a view of the Papenoo River. It reminded me of the Grand Canyon, except with lush vegetation instead of rocky terrain. The river curved through the valley surrounded by mountain peaks. In addition to the lush green vegetation, we saw beautiful tropical flowers in many colors. The most interesting green vegetation was a leaf that would curl up if you touched it. Before returning to the ship, we stopped for refrehsments which included fresh coconut milk and various local fruits. We thoroughly enjoyed this tour which took us off the beaten path and into the heart and soul of Tahiti. We were able to talk with local inhabitants enabling us to learn more about the culture. This was only the beginning of our Tahiti adventure. When we rejoin this cruise story, you'll be in Huahine. Until then, may you have warm tropical thoughts. As I promised, it's time to forget about the winter and think about something tropical. 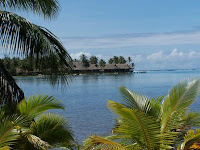 One of our favorite cruises was our 10 Day Polynesia / Cook Islands Cruise on Tahitian Princess. Tahitian Princess was previously one of the Renaissance vessels. 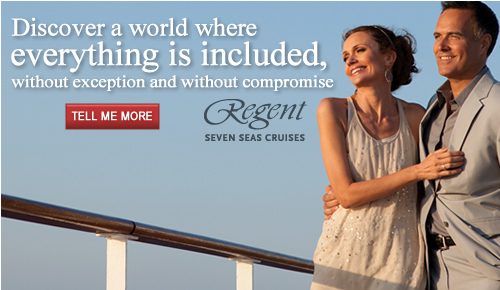 By today's standards, this is a small cruise ship. It is only 30,227 tons with a capacity of 670 passengers. 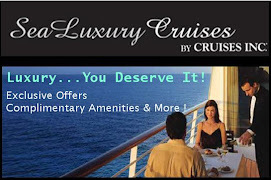 For that reason, it is necessary to book well in advance if you are planning a cruise on this ship. 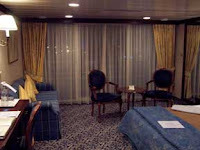 In our case, we booked about a year in advance and were able to obtain our first cabin category choice - a mini-suite (cabin 8030). You can see from the picture that there is plenty of room to relax in this cabin both inside and on your private balcony. The flight from Los Angeles (LAX) to Papeete (PPT) takes about 8 hours, so we decided to fly to California a day early. We spent the night at Hilton Los Angeles Airport. By flying out a day early, we broke up the long flight into something reasonable and also saved the $500 surcharge per person on Princess Cruises airfare (for other departure cities). 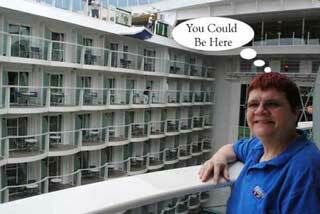 We usually purchase airfare on our own, but this time it was cost effective to use the cruise line air. It included transfers between airport and pier. The Hilton had a shuttle which we used to get back and forth from LAX. After breakfast, we caught the shuttle to the airport. The flight from LAX to PPT was via Omni Air charter. We had heard some horror stories about that airline, but were pleasantly surprised. Our seats were the last ones in the middle section of the DC-10. We had plenty of room and the service was very good. When we arrived in Papette, we went through customs and Princess Cruises had representatives there to guide us to our bus transportation. After checking in at the pier, we dropped off our carry-on luggage and headed back out into town to do some exploring. Since it was Sunday, almost everything was closed. We were able to purchase a flower bouquet for about $20 from a street vendor. 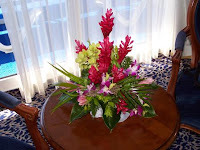 This flower arrangement lasted the entire length of the cruise. We would awake every morning to the smell of tropical flowers in our cabin. Those of you that have been reading my blog for awhile know that we have posted many photos on Kodak Gallery from our cruises. Tahiti was no exception to this practice. We must have thousands of photos in our albums from all our locations. Of all the albums, the Tahiti albums are the most popular amongst our visitors. I'll be discussing each of the ports in detail, but if you want to look at some photos in the meantime, see our Tahiti Pictures page. 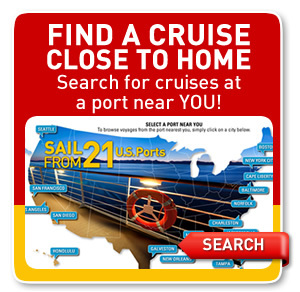 Unlike most cruises, there is an overnight stay in the departure port before setting sail for the rest of the islands. In my next post, I'll talk about the shore excursion we did in Papette. Amsterdam, Netherlands was the last port of our 12 Night British Isles / Norwegian Fjords cruise before returning to Harwich, England. It was a rainy day as we arrived in Amsterdam but that didn't dampen our excitement to explore this fabulous city. 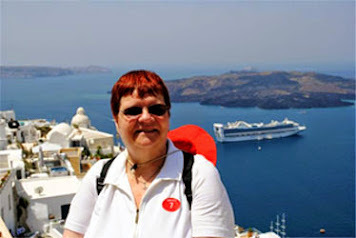 Our day began by taking a short walk from our ship to a canal boat owned by the son of one of our traveling companions. 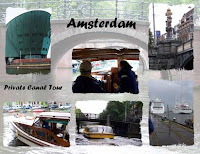 Our guide showed us Amsterdam from the best vantage point of all, the canals. Many people live on their canal boats which were docked along our path. It is an amazing sight to see flowers, lawn chairs, and other items that one might expect in a back yard, on the decks of these small boats. Traveling through the canals we'd see canal boat after boat on display as if in a contest. Of course, we knew better, they were simply homes on water that were decorated so that the inhabitants were comfortable. Our first stop was at the Willet-Holthuysen Museum where we explored this 17th century mansion that shows how the wealthy lived in Amsterdam canal houses. We had a self-guided tour of the various art collections inside the old mansion. There were beautiful chandeliers, stained glass windows, and crystal on exhibit. 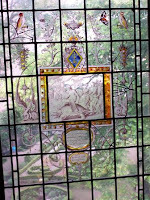 As you can see from this picture, we were able to view the gardens through the stained glass windows. For more pictures inside the museum, see our Amsterdam photo album. After we left the museum, we began the walking portion of our tour. We walked through the Red Light District, which is quite famous. You are not allowed to take photos once you are in the heart of the district. This is the oldest portion of the city. Continuing our walking tour, we arrived at the Royal Palace on Dam Square. The picture on the right shows the interior of the palace. We've been to many palaces on our cruises, but this was one of the most impressive palaces we've seen. The Crystalline Chandeliers are amongst the most magnificent we've ever seen for example. The detailed marble interior, the massive hallways with towering ceilings, the various artwork and artifacts kept us in awe the entire time. 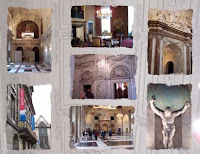 Again, see our photo album for pictures inside the palace. If you have never been to Amsterdam, I'd highly recommend a visit to the Royal Palace. After finishing our tour of the Royal Palace, we continued our walking tour of Amsterdam to another of the famous attractions, the Floating Flower Market. It was raining as we walked through the various shops in the market. We probably didn't spend as much time there as we would have if the weather were nicer. We purchased some tulip bulbs to take back home. It is possible to bring the flower bulbs home to the United States as long as they have an inspection certificate on the package. When we arrived back in the U.S., we declared the bulbs, showed them to the customs agent, and had no problems. Unfortunately, we did plant the bulbs but the squirrels dug them up in the winter, so we never did see them bloom. We walked to one of the nearby canals and once again boarded the canal boat for the final leg of our tour. The Jewel of the Seas was an awesome sight as we approached the pier. We had had a fabulous day in Amsterdam, despite the weather. In a future article, I'll write about our second visit to Amsterdam where we explored more of this fabulous city. That time we had much more time because we spent two days there before our North Cape cruise. 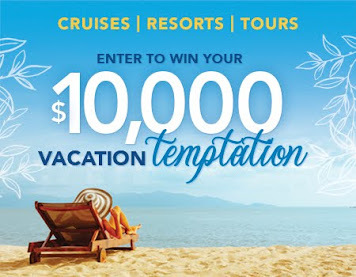 See our Cruise Website if you can't wait to read about it here. Next up, I'll take you to the land of French Polynesia. The weather here is cold and snowy so I thought it would be fitting to talk about something warm and exotic.